It's pretty natural for parents to ask teachers about how to help their child with reading. The question might come in different forms, sometimes like this... "Hi, I'm Johnny's mom. He's loving third grade. Hey, I've been meaning to ask you about his reading. What can we be doing at home to help him improve?" OR sometimes like this... "Hi, I'm Johnny's mom. He's loving third grade. But doggone it, every time I try to help him with his reading, we end up in a fight. Any tips?" All readers, from the strugglers to the most avid, can benefit from their parents' involvement. With the huge emphasis on close, critical reading and thinking deeply about texts, how can we take advantage of parents' knowledge as readers, and usually their willingness, to support what we are trying to develop in class? Read out loud with your child. I'm talking about all elementary grades here, and even more so with upper elementary. 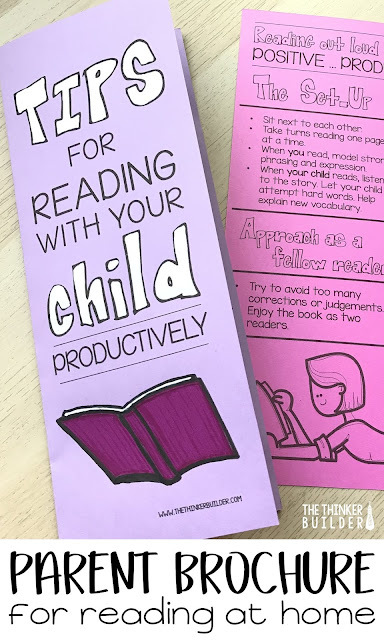 Yes, that's right, I'm saying to urge parents to sit with their third, fourth, and even fifth grade child and take turns reading out loud with him or her. This one act opens the door to so many other things, things that I don't think many parents realize. 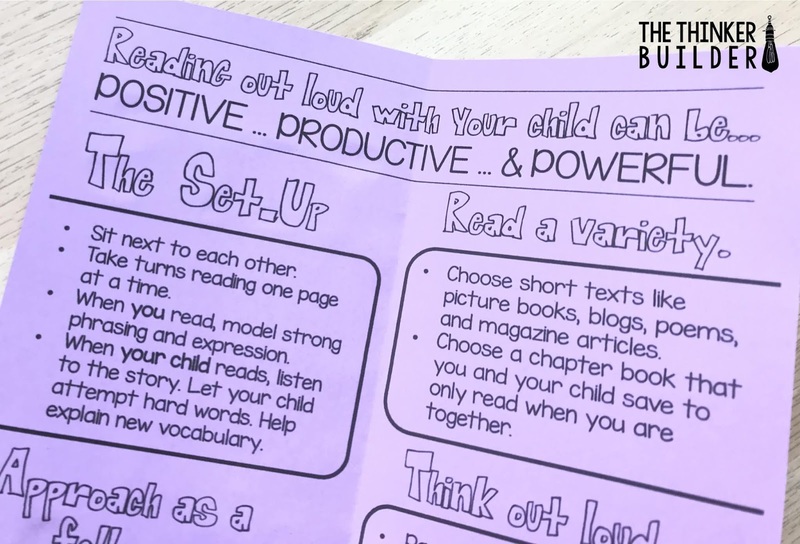 If we can help parents recognize (1) the skill they have as readers and as thinkers themselves, and (2) that they are capable of sharing that skill with their child through modeling, then a very powerful reading support system begins to take shape. We want you to approach the idea of reading with your child as a fellow reader, not as a parent. When you view the experience as equals... just two readers with the same book, your child feels less judged, his thinking more valued. It doesn't mean you need to pretend to be someone you aren't; children will see through that in a heartbeat. Be real. Bring your reading experience to the table. But simply by modeling your reading voice and sharing your honest thinking about text, rather than trying to instruct your child on how to do something, you can keep the interactions positive and productive, and we'll still get the reading growth as a byproduct. Don't focus on what your child is doing wrong in his reading. Correcting all mistakes and misinterpretations leads to your child getting frustrated, then you getting frustrated, then your child getting attitude, then you getting snarky, then your child shutting down. Am I right? But also be very careful with the compliments and praise. Too much "Good job!" or "That was perfect!" and subconsciously you begin sounding like, "I'm better at this than you, so I'll judge your performance." I'm not saying to never praise your child. Just support him with "reader-to-reader" compliments and observations, rather than "expert-to-novice" ones. Here's an example of a compliment from a fellow reader: "I like to stop and reread, too. It helps make sure the story sounds just right." Or, "When you explained what the character meant right there, I was thinking the same thing. How cool is that?!" Think of it this way: if you wouldn't say it to a friend in your own book club, don't say it to your child. Picture books lend themselves nicely to reading together because you and your child can read an entire book in one sitting. Upper elementary children tend to think picture books are "only for little kids," but authors like Patricia Polacco, Eve Bunting, William Steig, and Chris Van Allsburg, would beg to differ. Chapter books are probably the most natural choice, especially for upper elementary. Try choosing one separate from the books he reads on his own, one that is "reserved" for just the two of you. That way, you both are always on the same page with the story, both literally and figuratively. Other short texts can also be appealing to read together: magazine articles, poems, kid-appropriate community-related Facebook posts (Humans of New York, anyone? ), and ahem, blog posts. 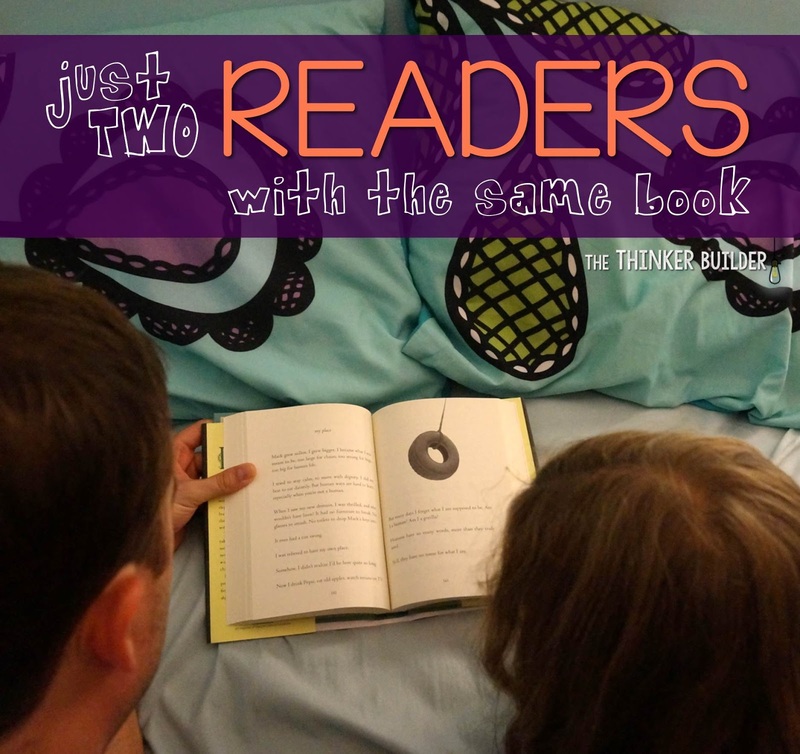 Agree on how to share the reading. Not sure where to start? Try this: you read one page out loud, then your child reads the next page out loud, and you continue taking turns. Make sure you are sitting next to your child so both readers are looking at the words being read. When you are listening to your child read, be sure you are really trying to understand the story yourself, not just assessing your child's performance. Help him with difficult words, nudging him to give it a shot first before you make a suggestion. Help him with new vocabulary he comes across. When you are reading, try to model strong reading fluency. Don't read fast. Rather, read with clear phrasing and expression. Pause once or twice to talk about something from the text. Verbalizing your thinking, in detail, is huge. 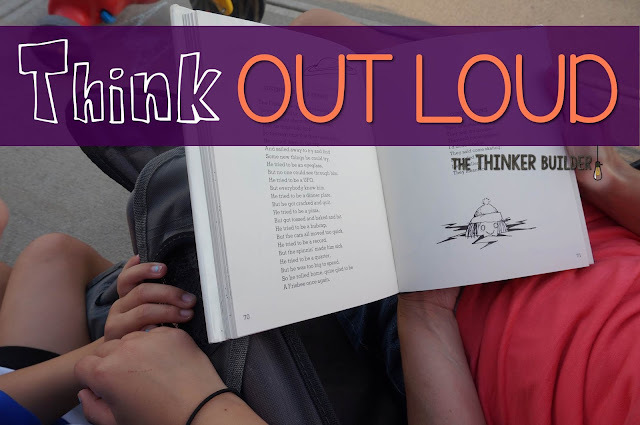 When you think out loud, your child hears the kinds of things a strong reader thinks about when she reads. It can take some getting used to, because much of what adult readers internalize happens so naturally, but teasing these things out for your child to hear is valuable. For example: "Do you see what I did there? Man, I really goofed that sentence up, but I didn't realize it until I got to this comma. So I decided to just go back and read the whole sentence again." Or, "This part reminds me of that time when you and I went fishing. Remember how frustrated we were?" Or, "I think I know why the author said that phrase right there. He's trying to trick us, don't you think?" Look for opportunities to pause the text to talk about it. Don't just wait until the end, either. A few timely exchanges throughout makes for a more meaningful post-discussion. Through modeling and prompting questions (in a "I truly want to know what you think" sort of tone), encourage your child to make predictions, take a stance and form opinions on issues, refer to parts of the text that support his thinking, and share how certain sections or phrases make him feel. And afterward, try something like: "I'm proud of you for working on that (or) thinking so hard about that (or) sharing your thoughts about that (or) taking a stand on that (or) being honest with how you feel about that. Aren't you proud of me, too?" You might get a minor eye-roll, but a smile will probably accompany it. Yeah I said it. 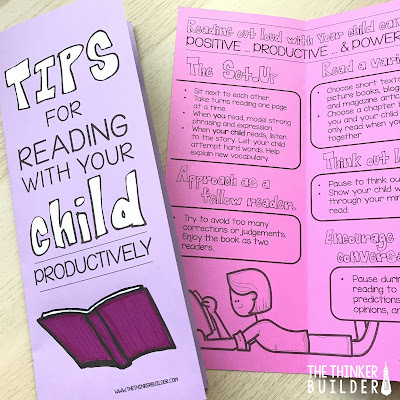 Unless your child really enjoys writing down his thoughts about a book, don't even ask him to do it, even when you and I both know that writing-about-your-reading is important and something we do all the time in class. Don't ask him to summarize the story in a paragraph. Don't ask him to create a story map. Don't ask him to write a book report. Do you do any of those things when you read for pleasure? Instead, focus on discussing ideas out loud, because guess what: being able to understand and analyze a text, explain and support one's own thinking, and listen to, build on, or disagree with someone else's thinking, all verbally, well, I'd argue it's as important, (if not more so) than putting it into writing... and it's almost always more appealing. Carry your conversations into other parts of the evening. I know you're already in a time crunch as it is. Talking about a book in the car, while setting the table for dinner, during dinner, or during the bedtime routine, can help curb the feeling that you're just adding one more thing to an already crowded night. 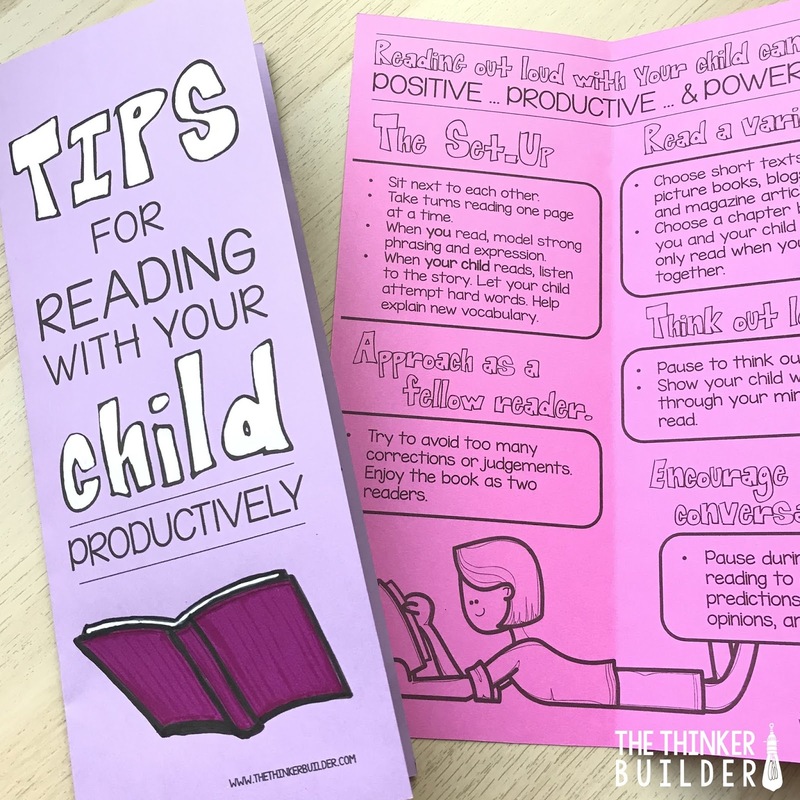 I created a parent brochure containing many of the tips I wrote about in this post, as well as some example prompting questions parents can use when they are reading with their child at home. It's perfect to hand out at a Meet-the-Teacher night, or during parent-teacher conferences. A Spanish version is included, too! It's FREE when you sign up for my free email newsletter. Use the sign-up box below the following picture. Teachers, think about the power of a one-to-one reading conference with a student. Even a few minutes of focused, custom instruction with a reader impacts that reader right away. (If only we had more time for this, right?) But we can give parents a few tools, not ones to replace the instruction we give at school, but tools to help them open up and share their own reading toolbox. And in turn, they help fill their child's toolbox, too.